Originally known as the "Powder Treason," the Gun Powder Plot of 1605 revealed an explosive controversy between the Catholic citizens of England and King James. This conspiracy was the third of four attempts at harming the King, who was a supporter of the Calvinist faith. The motive behind this plot was revenge for the penal laws, which were measurements against priests and recusants. In 1604, a peace treaty between England and Spain ended the hopes of foreign intervention on behalf of other Catholics. In desperation, Robert Catesby masterminded the a plot to kill King James and establish a more Catholic friendly government. After bringing in additional aid for the conspiracy he rented an adjoining cellar which ran immediately below the House of Lords within the Parliament House. The cellar was filled with barrels of gunpowder and iron bars, all of which was concealed by lumber. Guy Fawkes was chosen to ignite it during the opening night of the House of Lords. In the blast it was assumed that both the King and his two sons would be killed, which would allow Princess Elizabeth to inherit the throne. However, as the time came to enact the plan, Lord Monteagle and Lord Salisbury became concerned about their Catholic friends in the House of Lords. So on October 26, 1605 they sent a letter to Cecil, one of King James advisors, anonymously warning him of the scheme. This resulted in the termination of the plans and the scattering of many of the conspirators; however Guy Fawkes was not warned. So on November 5 he showed up at the cellar, torch in hand, only to be arrested by the King's agents. After his arrest, Guy Fawkes was tortured for information regarding the other conspirators. 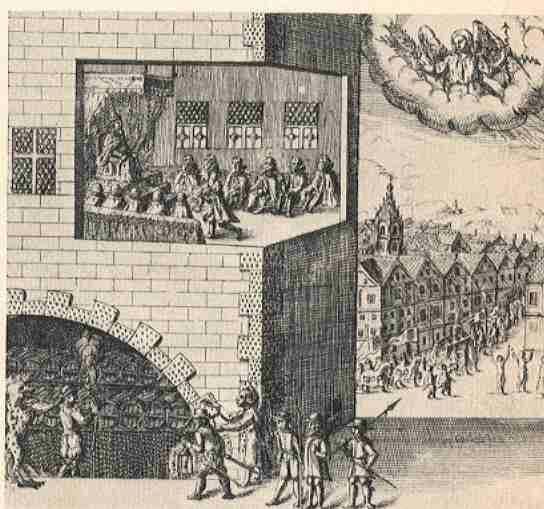 On January 31, 1606 a trial was held where Fawkes along with seven other defendants were charged with "traitorously conspiring to kill the King and the Queen and Prince Henry; raising sedition and producing a miserable slaughter in the realm; causing rebellion and subverting and changing the government and true worship of God Established in the Realm; and also inviting foreigners to invade the Realm and make war against the King." (1) To these charges, the conspirators pleaded not guilty despite their confessions. At the end of the trial all eight were found guilty of high treason; of which four, including Fawkes, were hanged on January 31, 1606. Through all of this no accomplices of Catesby were ever found, leading some to believe that the Earl of Salisbury was the inside connection. To this day the Gun Powder Plot, and Guy Fawkes, are still remembered on November 5 in Ireland and by others who oppose the British Government. It is now considered a day of Thanksgiving celebrating the thwarting of this planned act of terrorism. (2) taken from King James page 109. Fraser, Antonia. King James. (New York: Alfred A. Knopf, 1975. pp 70, 105-110). "Guy Fawkes." Dictionary of National Biography, Vol. VI. (London: Oxford University Press, 1950). pp 1130-1132. Mathew, David. James I. (Alabama: University of Alabama Press, 1967). pp 141-150.